Identify the constellation of relevant signs/changes. Nest these within a diagnosis or diagnoses. Understand the factors that contribute to the development and maintenance of the diagnosis. Use your treatment to modulate these factors in a manner that can be measured and tracked by alterations in the clinical signs and profile. Unfortunately, practitioners often feel helpless in the face of behavioral complaints because the signs seem so nonspecific. As is true in internal medicine, relevant clinical signs in behavioral medicine are not specific, but too few veterinarians are taught to recognize and quantify behavioral signs and to do so as part of routine evaluation. As for all other conditions in veterinary medicine, the best and most successful treatment is early treatment. The earlier appropriate behavioral medication is prescribed, the less the patient will suffer from fear, anxiety, or aggression and the cognitive and social changes that result from these pathologic conditions. A helpful approach to understanding the thought process involved in choosing medications is to consider practical diagnostic examples, review the signs exhibited in these examples and the regions of the brain involved, and review effects of medications on those regions and on neurochemicals affecting these regions. An advantage of this approach is that the clinical signs provide a baseline against which targeted signs can be assessed for response to medication and other treatment. Consider patients with 2 common behavioral diagnoses: separation anxiety and noise reactivity/phobia. These are commonly comorbid conditions,1 as is the rule among anxiety disorders.2,3 Because the development of both conditions ranges from subtle to explosive, veterinarians should screen for them at each appointment using a standardized clinical assessment tool4 to identify and treat them early. Results of these routine clinical assessments should be recorded and evaluated to determine whether they meet diagnostic criteria (Box 1). Signs of distress should be evaluated in currency and terminology that are meaningful for the individual patient because the most commonly reported behaviors (elimination, destruction, excessive vocalization) are only the most readily apparent and easily recognizable signs of anxiety for the clients and veterinary team. Drooling, panting, freezing, withdrawal, and cognitive signs of anxiety are less commonly diagnosed because they are less apparent to people, but dogs displaying them may be even more profoundly affected than dogs that show more obvious signs (Box 2 lists signs of anxiety). Behavioral abnormality resulting in profound, nongraded, extreme response to noise, manifested as intense avoidance, escape, or anxiety, associated with sympathetic nervous system signs. Dogs can shut down and freeze or run without caution. Decreased sensitivity to pain or social stimuli is often concomitant. Once established, repeated exposure results in an invariant pattern of response, but not all dogs show a full-blown invariant response. Behavioral abnormality resulting in a sudden, all-or-nothing, profound, abnormal response that results in extremely fearful behaviors (catatonia, mania, escape) where the provocative stimulus may be unknown/unclear, situational, internal, and/or generalized. Differs from conditions involving phobias, where the provocative stimulus is more discrete and identifiable, and where the level of distress characteristic of panic may not be achieved. The term panic disorder should be restricted to a described pattern of like events. A panic event is a singular or infrequent event where the patient exhibits these behaviors, but the data are insufficient to determine whether the consistent pattern exists as required for panic disorder. The risk that a patient will experience another panic event after having had one is great. Dogs that are distressed when exposed to noises or storms but do not meet the criteria for a noise phobia may best be classified as “reactive” and assessed for treatment. The risk for worsening in these dogs is nontrivial. Even the mildest signs should be treated if a dog has any history of reacting to noises.6 Clients may insist that they can simply hold the dog while it pants and shakes or that the dog calms itself by hiding in the closet. In fact, these patients are suffering and need behavioral medication. Video is a powerful tool for accurate diagnosis and an even better way to assess response to medication and other treatment. Medications commonly used to treat fears, anxieties, and aggression in dogs are listed in Table 1. Many other medications used to treat some aspect of behavioral abnormalities are beyond the scope of this article and so are not discussed here (but see Overall 20135). 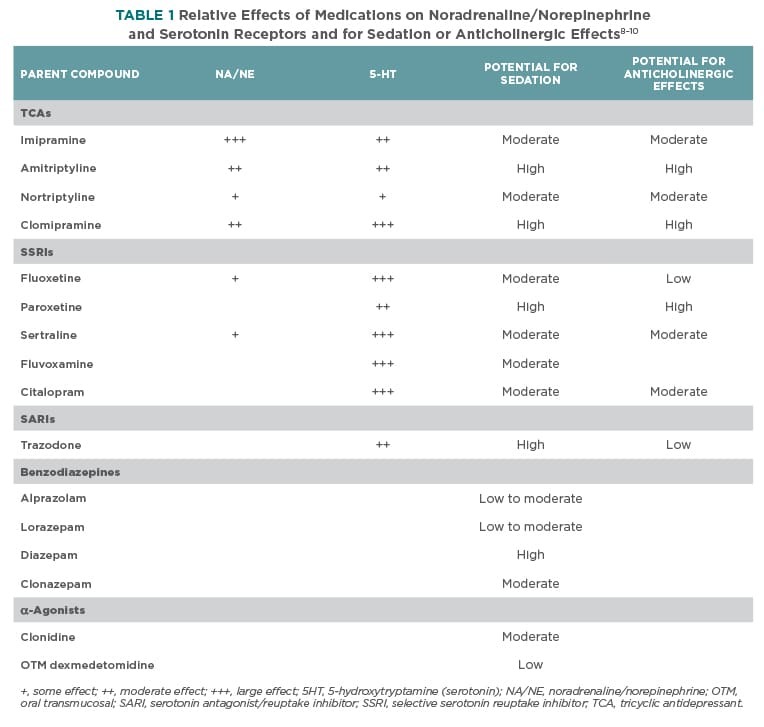 Table 1 compares many of these medications, by class, with respect to their effects on noradrenaline/norepinephrine (NA/NE) and serotonin (5-HT) receptors and sedation and anticholinergic effects. 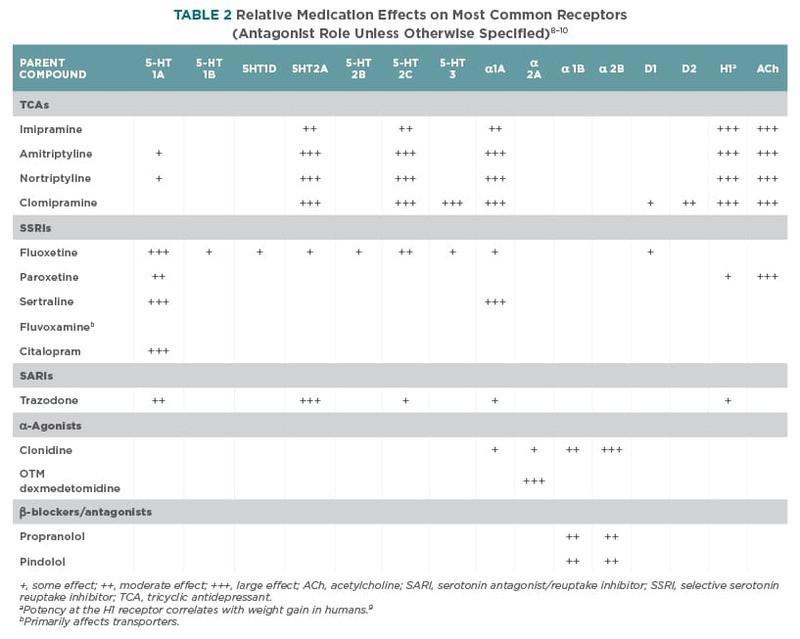 Table 2 indicates the relative effects of these medications on receptor classes. Because so many behavioral conditions are comorbid or have wildly different behavioral presentations within a diagnosis (eg, dogs with noise phobia can freeze and hide or may run and destroy in panic), the best approach is probably one that allows combination of medications to address the neurochemical profile of the behavioral abnormality but minimizes somatic risk. Box 3 provides a general model for such an approach. Most of these medications are metabolized through the cytochrome P-450 system. 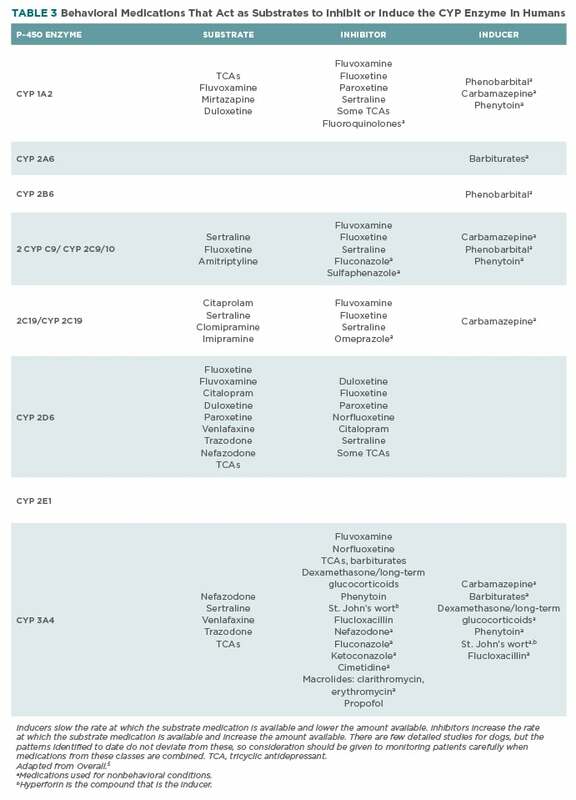 Table 3 lists inducers and inhibitors that affect how these behavioral compounds are metabolized. Understanding such P-450 enzyme system interactions allows medication adjustment to minimize adverse events. Although most available information is for humans, some studies have measured CYP effects for dogs,11–14 with particularly strong conservation for CYP 1A enzymes. Isoforms are sufficiently similar between humans and dogs that inference from human information may serve as a good precaution. BZD, benzodiazepine; SSRI, selective serotonin reuptake inhibitor; TCA, tricyclic antidepressant. Applying an approach that seeks to tailor treatment in behavioral medicine to specific presentations and targeted signs is not difficult but does require thought. A dog with separation anxiety that involves salivation will benefit from any anticholinergic agent because the undesirable effect may be part of a reinforcing feedback cycle. Medications classified as anticholinergics are not used in veterinary medicine; however, many medications have anticholinergic effects as part of their pharmacologic profile. Anticholinergic effects are common for many tricyclic antidepressants (TCAs), and although they have the potential for undesirable events, in this example, a medication with some anticholinergic effect may be beneficial. Additionally, a region in the central nucleus of the amygdala contributes to salivation, suggesting that medications that affect serotonin and norepinephrine regulation will be useful. Accordingly, amitriptyline or clomipramine may be rational choices, but clomipramine comes in a canine form (Clomicalm) with scored tablets, is a relatively more specific compound because of its intermediate metabolites, and affects a wide range of receptor types. It may be a good choice here. If the dog is vocalizing or blocks or destroys doors through which clients leave, the behaviors are associated with affiliation and social needs and loss. A medication that has a profound effect on 5HT receptors, especially the 5-HT1A receptors that are involved in social anxieties, may benefit the patient. Unfortunately, medication costs and formulations change frequently. What do we do if clients cannot afford or obtain any formulation of clomipramine, a particular problem in the United States in the past few years? By reverting to the idea that distress about absences lies at the core of separation anxiety, pick a selective serotonin reuptake inhibitor (SSRI) affecting the 5-HT1A receptor because this receptor has been widely experimentally associated with social anxieties. If broader coverage is needed, combine it with a less specific TCA (amitriptyline, nortriptyline) and lower the dosage of both. What are the concerns if the patient also reacts badly to noises? Here, we need to distinguish between panicking and being distressed (Box 1). If the dog is distressed, any of the benzodiazepines may lower its reactivity level by providing central inhibition of responses. Benzodiazepines can be calming agents, antianxiety agents, or sedative and analgesic agents, depending on dose, route, and choice of medication. Alprazolam is considered the only truly “panicolytic” benzodiazepine. These compounds should not be used to treat patients in households where humans have addiction or substance abuse difficulties. Dogs that are distressed about noise or departures may respond to lorazepam and become calmer, while others may need longer-lasting benzodiazepines (diazepam, clonazepam), which may also make them sleep more. Additional and deeper sleep may not always be an adverse or sedative effect of a behavioral medication, but with long-term use benzodiazepines can disrupt natural sleep rhythms. This is not a major concern for short-term treatment. Anxious dogs likely have interrupted sleep cycles; clients often say they notice that once the dog begins to respond to medication, the dog sleeps longer or more deeply. Good, restorative sleep should be a treatment goal. In contrast, excessive sedation, including persistent cognitive impairment, lack of motor coordination, or paradoxical excitement, is an undesired effect. The key with benzodiazepines is finding the right dose for the patient; these medications have highly variable effects. Having clients test benzodiazepines for adverse events, such as excessive sedation or paradoxical excitation, when no stimulation is expected is an important step. If no adverse effects are observed, clients should then help test and record the effects of increasing dosages to see if they can find one that provides relief. Clonidine, an α2 agonist, may also aid distressed dogs by decreasing both central and peripheral signs of sympathetic arousal. At higher dosages, clonidine can be both sedative (impairing cognition) and hypotensive (rendering patients unstable on stairs or as they move through complex environments). If these effects appear, lowering the dose may ameliorate them. Trazodone, a serotonin antagonist/reuptake inhibitor (SARI), may help the dog to calm its activity level because the main effect of this drug is a slightly sedative one—trazodone increases sleep time,15–17 and its receptor profile (5-HTA/B antagonist, partial 5-HT1A agonist) is consistent with this. If the dog is panicking, there are 2 additional suitable choices. The first, alprazolam, can be given before or during the distressing event. In fact, if it is given regularly (usually q12h but up to q6h) before anticipated events, it can raise the threshold for reaction but provide central inhibitory effects, as well as peripheral effects on muscle tension that may accompany and provide a positive feedback response associated with panic. The second choice is dexmedetomidine, which has anxiolytic, sedative, analgesic, and sympatholytic properties.18 As an oral transmucosal (OTM) gel (Sileo; zoetisus.com), it has no first-pass effects; instead, it directly exerts agonist effects on presynaptic α2 receptors in the locus ceruleus. The locus ceruleus is the region of the brainstem that gives rise to all NA/NE brain tracts and is where sympathetic arousal may originate and is modulated. In essence, this region is the source of anticipatory anxiety and arousal. Accordingly, without involving the CYP 450 enzyme system, OTM dexmedetomidine may have profound panicolytic effects and may prevent and/or modulate the arousal that makes it so difficult for humans to use any behavioral or environmental management strategies or for dogs to use any operant or cognitive-behavior management skills they may have learned. With both separation anxiety and noise phobia/reactivity, dogs may feel nauseous. Distressed dogs cannot eat because of antagonism of parasympathetic effects due to sympathetic arousal. However, the distress itself may contribute to nausea. For dogs that retch, salivate, chew on nonfood substances, have diarrhea before or after the event, stop eating before the event, and take a long time to eat after the event, we should consider whether maropitant (Cerenia; cereniadvm.com), the neurokinin 1 receptor antagonist/substance P blocker, could be beneficial. This compound may have a role in directly treating aspects of depression, fear, and anxiety19 but may be helpful for the more immediate gastrointestinal effects that may be associated with distress. In dogs with combined abnormalities that cause them to react to noise and absences, medications from 2 to 4 classes may need to be combined to achieve maximal resolution of signs. As to be expected from the patterns of receptor response, when medications that share a direct mechanism of action and/or a potential adverse effect are combined (eg, sedation, shared CYP 450 enzymes), dosages should be lowered. Occasionally, frequencies may be altered, rather than dosages lowered, depending on the dog’s response. If 2 medications that are combined both affect serotonin, reduce the dose of both to minimize the risk for serotonin syndrome. This condition is rare and usually idiopathic, and data in dogs are lacking; however, it can be tragic. Although not discussed here, monoamine oxidase inhibitors (eg, selegiline) should not be combined with TCAs, SSRIs, or SARIs. Behavioral medicine and neuroscience are about pattern recognition. This brief introduction to thinking in a neurobehavioral mechanistic manner is intended to introduce clinicians to how to recognize and use relevant patterns for the benefit of the patients. We are learning more about genetic and functional patterns daily, and new applications for medications may result. By using the tables in this article to inform medication choice and to become comfortable with a few different treatment combinations, clinicians can make great improvements in their patients’ mental health and in everyone’s quality of life. Overall KL, Dunham AE, Frank D. Frequency of nonspecific clinical signs in dogs with separation anxiety, storm/thunderstorm phobia, and noise phobia, alone or in combination. JAVMA 2001;219(4):467-473. Tiira K, Lohi H. Early life experiences and exercise associate with canine anxieties. PLoS One 2015;10(11):e0141907. Tiira K, Sulkama S, Lohi, H. Prevalence, cormorbidity, and behavioral variation in canine anxiety. J Vet Behav Clin Appl Res 2016;16:36-44. Hammerle M, Horst C, Levine E, et al. AAHA 2015 Canine and Feline Behavior Management Guidelines. aaha.org/professional/resources/behavior_management_guidelines.aspx. Accessed November 2016. Overall KL. Manual of Clinical Behavioral Medicine for Dogs and Cats. St, Louis, MO: Elsevier; 2013. Overall KL, Tiira K, Broach D, Bryant D. Genetics and behavior: a guide for practitioners. Vet Clin North Am Small Anim Pract 2014;44(3):483-505. Davis M. Neurobiology of fear responses: the role of the amygdala. J Neuropsychiatry Clin 1997;9(3):382-402. Cusack B, Nelson A, Richelson E. Binding of antidepressants to human brain receptors: focus on newer generation compounds. Psychopharmacology (Berl) 1994;114(4):559-565. Gillman PK. Tricyclic antidepressant pharmacology and therapeutic drug interactions updated. Br J Pharmacol 2007;151(6):737-748. Tatsumi M, Groshan K, Blakely RD, Richelson E. Pharmacological profile of antidepressants and related compounds at human monoamine transporters. Eur J Pharmacol 1997;340(2-3):249-258. Martignoni M, Groothuis GMM, de Kanter R. Species differences between mouse, rat, dog, monkey and human CYP-mediated drug metabolism, inhibition and inductions. Expert Opin Drug Metab Toxicol 2006;2(6):875-894. Bogaards JJP, Bertrand M, Jackson P, et al. Determining the best animal model for human cytochrome P450 activities: a comparison of mouse, rat, rabbit, dog, micropig, monkey and man. Xenobiotica 2000;30(12):1131-1152. Turpeinene M, Ghiciuc C, Opritoui M, et al. Predictive value of animal models for human cytochrome P450 (CYP)-mediated metabolism: a comparative study in vitro. Xenobiotica 2007;37(12):1367-1377. Van Beusekom CD, Schipper L, Fin-Gremmels J. Cytochrome P450-mediated hepatic metabolism of new fluorescent substrates in cats and dogs. J Vet Pharmacol Ther 2010;33(6):519-527. Haria M, Fitton A, McTavish D. Trazodone. A review of its pharmacology, therapeutic use in depression and therapeutic potential in other disorders. Drugs Aging 1994;4(4):331-55. Gruen ME, Sherman BL. Use of trazodone as an adjunctive agent in the treatment of canine anxiety disorders: 56 cases (1995-1997). JAVMA 2008;233(12):1902-1907. Gilbert-Gregory SE, Stull JW, Rice MR, Herron ME. Effects of trazodone on behavioral signs of stress in hospitalized dogs. JAVMA 2016;249(11):1281-1291. Gertler R, Brown HC, Mitchell DH, Silvius EN. Dexmedetomidine: a novel sedative-analgesic agent. BUMC Proc 2001;14:13-21. Varty GB, Cohen-Williams ME, Hunter JC. The antidepressant-like effects of neurokinin NK1 receptor antagonists in a gerbil tail suspension test. Behav Pharmacol 2003;14(1):87-95. Karen L. Overall, MA, VMD, PhD, DACVB, is a senior research scientist in the Biology Department at the University of Pennsylvania. She received her VMD degree from the University of Pennsylvania and her PhD from the University of Wisconsin-Madison. She did her residency training in veterinary behavioral medicine at the University of Pennsylvania. She has served on the faculties of both the veterinary and medical schools at the University of Pennsylvania and ran the Behavior Clinic at Penn Vet. Dr. Overall has been named the North American Veterinary Conference Small Animal Speaker of the Year. Her research focuses on neurobehavioral genetics of dogs, the development of normal and abnormal behaviors, and how behavior is assessed, especially as concerns working dogs.